Primary Natural Resources petroleum, natural gas, phosphates. 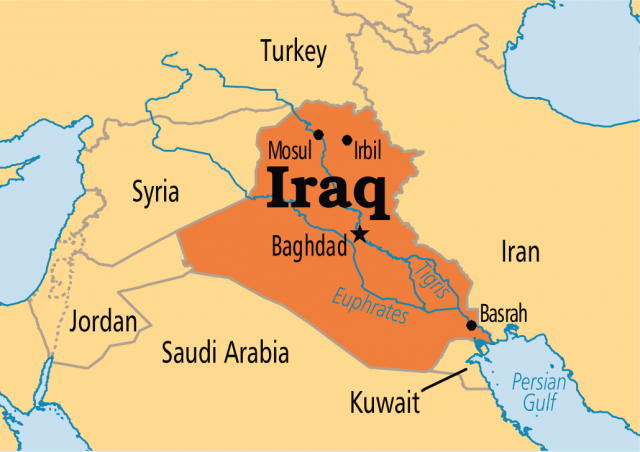 IRAQ IS A MIDDLE EASTERN country, bordering the PERSIAN GULF, between IRAN and KUWAIT. Iraq is also bordered by TURKEY, SYRIA, JORDAN, and SAUDI ARABIA. The country contains most of the large flat basin created by the Tigris and Euphrates rivers. Both great rivers have their origin in high mountains outside of Iraq. The expansive landscape slopes down from these heights descending gradually to the Persian Gulf in the southeast. Here, the two rivers have created a large DELTA that forms the Shatt al-Arab shared with Iran. To the south, the broad plains mingle with the vast deserts of Saudi Arabia. The mountainous region of northern Iraq receives appreciably more precipitation than the central or southern desert regions, yet extensive irrigation makes much of the country arable along the two great rivers. From ancient times, the area of Iraq has been known as Mesopotamia. One of the great hearths of human civilization, the Tigris-Euphrates river complex has supported many kingdoms, empires, and dynasties. Sumerian, Babylonian, and Parthian cultures emerged and flourished before the faith of ISLAM made its way to Iraq in the 7th century C.E. A great Islamic empire, the Abassid caliphate, established its capital at Baghdad, which, in turn, eventually became an outpost of the OTTOMAN EMPIRE. Centuries of commercial trade and cultural exchange continued in a stark land as the fortunes of the great Turkic empire of the Ottomans and other Islamic dynasties, such as the Safavids, rose and fell. As the Ottoman Empire expired at the end of World War I, Iraq was occupied by the British and in 1920 became a British-mandated territory under the auspice of the League of Nations. When declared independent in 1932, the Hashemite family, which also ruled Jordan, ruled as a constitutional monarchy. A republic was proclaimed in 1958, with the killing of the monarch and establishment of power by a military strongman. Continuing political assassinations and overthrows eventually brought the Arab Socialist Renaissance Party (Ba’ath Party) to power in 1963. In 1979, a protégé of the party, Saddam Hussein, was selected by the outgoing ruler and began his role as supreme leader. Acting in the bellicose style of his predecessors, Hussein used territorial disputes with Iran as cause to launch a bloody and inconclusive war that lasted for eight years (1980–88). The West supported Iraq by sale of arms and provision of military intelligence. This war saw the first large-scale use of chemical weapons since the battlefields of Europe in World War I. The use of these weapons was to haunt Hussein’s regime. Facing tremendous debt, degraded commercial access to the gulf, and dismal return on vast military expenditures, Saddam used similar logic and bluster when in August 1990 Iraq invaded and annexed Kuwait. The threat to the free flow of oil to the industrialized West and Asia galvanized a United Nations (UN) coalition, launching a U.S.-led attack that freed Kuwait in 1991 and destroyed much of Iraq’s military capability. The UN Security Council required Iraq to end all production and procurement programs related to weapons of mass destruction and long-range missiles. This was to be verified by UN inspectors, but because of noncompliance by Iraq, a decade of sanctions, embargoes, and military actions ensued. In March 2003, the UNITED STATES led an invasion of Iraq and the overthrow of the Hussein regime. The occupying U.S.-led coalition and recognized Iraqi leaders established advisory and governing councils on the local, regional and national level to ensure that the path into the political future results in elections to establish an internationally recognized representative government in Iraq. Most of Iraq’s population lives on the ALLUVIAL PLAIN stretching from the mountains of the north toward the Persian Gulf off to the southeast. The Tigris and Euphrates rivers continue to be the focus of human settlement as they have been since ancient times. The ruins of great cities of history such as Ur and Babylon share this landscape with the biblical location of the Garden of Eden. Over three-quarters of the Iraqi population is Arab, but the Kurds make up a significant ethnic minority. The Kurds are host closely associated with the mountainous regions and hold to the Sunni sect of Islam. The Kurds of Iraq have long shared the misfortunes of a stateless nation along with their kinsman in Turkey, Iran, and Syria. The Kurds remain culturally distinct in language, customs, and politics. The majority of Arabs in Iraq are followers of the Shia sect of Islam but have long been oppressed by political leaders holding to the Sunni sect. One of the more notable incidents of this was the systematic effort to destroy the Marsh Arab culture found in the southern marshes near of the mouth of the Euphrates River. These Shia communities had long thrived in the reedy marshlands that comprised a natural food-producing region. A Ba’ath regime policy to drain the marshes was implemented to control insurgent movement in the area and introduce irrigation agriculture. This massive drainage project resulted in an ecological and cultural disaster, as salinization of the soil spread and traditional communities were displaced. The petroleum sector has dominated the economy of Iraqi even before nationalization of its oil industry in the 1970s. The disastrous war with Iran followed by the ill-conceived invasion of Kuwait left Iraq with hundreds of billions of dollars of international debt, economic losses, and war reparations. Further economic sanctions by the UN related to disarmament removed the country from any meaningful role in the world economy. However, with the world’s third-largest proven oil reserve and promising unexplored oil-bearing regions, Iraqi oil stands to create significant revenue for some time to come. After the U.S.-led invasion, the UN Security Council lifted all sanctions against Iraq and passed resolutions to ensure that Iraq’s oil export earnings are immune from legal proceedings, such as debt collection, until the end of 2007.